Positive Grid is responsible for some of our favourite plugins and apps of recent years, and now the California co has announced big discounts in the run-up to Black Friday. Chief among the plugin deals is $50 off BIAS FX Std (now $49), BIAS FX Pro (now $149), BIAS Pedal Distortion (now $49) and BIAS Pedal Delay (now $49), while the Pro Series Compressor and Pro Series EQ are $50 off at $49 apiece. 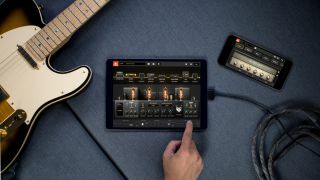 Apps are also discounted, with JamUp Pro, Final Touch and X Drummer all available for $10, which is 50% off. Oh, and if you act before 14 November, you can secure a $40 discount off BIAS Amp 2 Elite - one of this year’s guitar modelling highlights - using the code BA2ELITE20. Noice!